90% of turkeys are intensively reared for their meat in windowless sheds. Wild turkeys are strong fliers, roost high up in trees and travel across wide areas in search of food. The majority of turkeys are kept in windowless sheds containing up to 25,000 birds. Selective breeding of unnaturally large turkeys with huge amounts of breast meat causes hip problems, chronic pain and an inability to mate naturally. Artificial insemination is required. Surplus chicks, known as ‘hatchery waste’, are killed by a number of permitted methods. Overcrowding causes aggression and cannibalism in turkeys which has to be controlled by beak trimming and de-snooding. 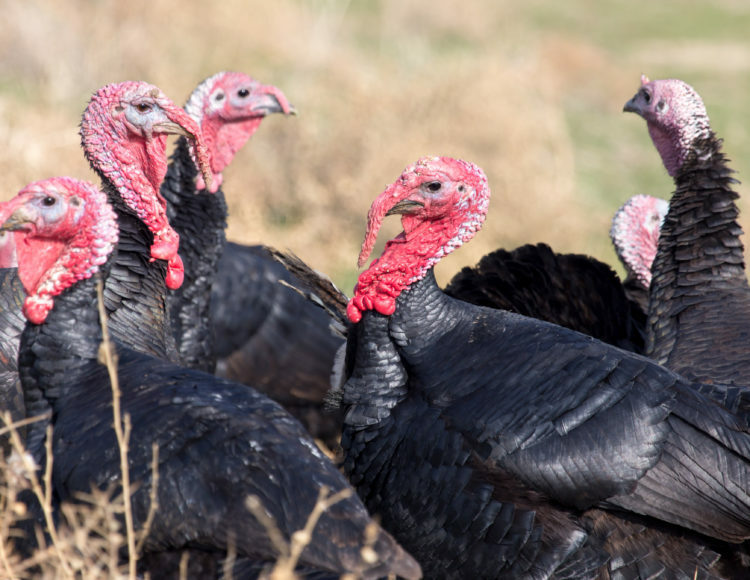 Intensively reared turkeys are particularly prone to a number of diseases such as lameness, bird flu, turkey rhinotracheitis and bacterial infections. Turkeys are nervous and easily frightened and often suffer injury during transportation. Transport to slaughter can be long distance and the birds may experience extremes of temperature, stress, suffocation and shock. Turkeys are slaughtered between nine and 21 weeks old but the natural lifespan of a turkey is 10 years. They are dragged head first through an electrically charged stunning water bath to make them unconscious before having their necks cut. Due to the additional demand for turkeys at Christmas ‘seasonal slaughterhouses’ are used.